This tutorial walks you through creating your first connected contract containing the Fragile Goods Smart Clause®. With the help of a delivery simulator app, this tutorial illustrates how to send data to Clause from a third-party application. Sign up for Clause at https://hub.clause.io. Once your Clause account has been created you will receive an email. Click the link in the email to confirm your email address and to agree to the Terms and Conditions of use. Return to the contract dashboard by pressing the Contracts button in the menu bar. To create a new contract you can either upload an existing contract (as a PDF or MS Word document) or you can start a new contract by pressing the Create New Contract button. You should now have the contract text open in the contract editor. You can edit the text of the contract as necessary. Note that the editor will autosave your changes. Now is a good time to press the pencil icon to the right of the name of the contract at the top of the contract editor. Enter a descriptive name, description and optionally some tags for the contract. This metadata will help you find and organise your contracts in the contract dashboard. Contracts must have at least two signatories, so press the Add signatory button in the menu bar at the top of the contract editor. Enter the first and last name of the signatory along with their email address. Now it's time to make this a smart legal contract! Move your cursor position to where you would like to insert a payment clause into your contract. If necessary, select the Smart Clauses tab to the right of the editor, then press the Add Clause button followed by the Add to contract button beneath the fragile-goods smart clause. You should see the Smart Clause inserted into the contract text. You can either edit the text of the smart clause inline in the contract or using the Parameters property sheet to the right of the contract editor. The fragile-goods smart clause calculates a penalty based on the number of shocks that are recieved by a parcel during shipment. The final payment due is calculated by deducting the penalty from the contract price. The source for the fragile-goods template is available in the Accord Project template library. To simulate sensor readings being sent to your contract, we provide a delivery simulator. This UI allows you to use the accelerometer in your mobile device to create shock-events. Before starting the timer in the delivery simulator, copy and paste the Trigger URL and Access Token into the fields in the page. The values for these fields can be found under Trigger in the side panel for the fragile-goods clause. The source code for the Delivery Simulator is available on GitHub. 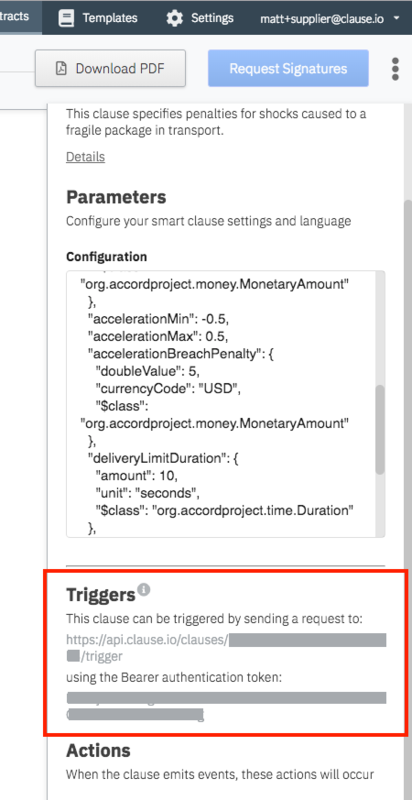 Further documentation on the Trigger API is also available. You can view the history of contract events by pressing the Timeline tab to the right of the contract editor. You should see events for adding signatories, saving the contract, adding smart clauses etc. Before sending the contract out for signature you probably want to see a preview. You can download the contract as a PDF document by pressing the Download PDF button. Congratulations! You have completed the Fragile Goods tutorial! Please check out our other tutorials.